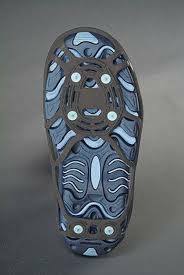 Its tungsten carbide Ice Diamond Spikes, which are 10x stronger than steel, provide increased traction that help with preventing slips and falls on ice and snow, which will help reduce the risk of pulled muscles, fractured bones or even back problems caused by a quick slip or fall. When not in use, the compact design makes them easy to store in small places such as, your coat pocket, handbag, briefcase or the glove box. This is a staff favorite!